(Toronto, Ont.) Team Netherlands added another win to their unblemished 4-0 record, while Team USA found a second victory against Great Britain in the women’s wheelchair basketball competition at the Mattamy Athletic Centre. After capturing an early lead against Canada, the Netherlands closed the opening half of the game with a 23 point lead. Even with a strong effort from Canada in the second half the hometown team wasn’t able to close the gap. The Netherlands maintained their momentum and ultimately outscored Canada to win the game 77-39. Katie Harnock led the Canadians in scoring with 12 points while Mariska Beijer once again boasted the team best for the Dutch with 24 points. Team USA faced a tough battle for their 63 – 45 victory against Great Britain in the second game of the night. The British managed to stray no more than 5 points behind the USA throughout the first half but slipped further behind throughout the second. American Desiree Miller achieved the game-high 29 points while Amy Conroy of Great Britain scored a team-high of 13. Canada will rematch against rival Team USA at 6:15 p.m. ET on Sunday, and the Netherlands will attempt to finish with a flawless record when they tip off against Great Britain at 8:30 p.m. ET. Action continues through to Sunday at the Mattamy Athletic Centre. All games are open to the public. The Toronto Challenge marks the first major test for the Canadian women as they proceed with team selections and preparations on the road to Rio 2016. Canada is the reigning world champion and the top-ranked team heading into the Paralympic Games. 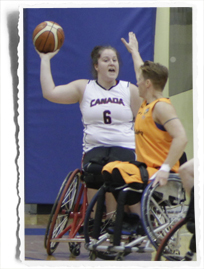 For more information, please visit www.wheelchairbasketball.ca.